Manage application symbols for server-side symbolification. If you are submitting minidump files then you will need to ensure that debug symbols have been uploaded to Backtrace in order to have accurate classification, deduplication and callstack rendering. In Visual Studio, your DEBUG build will generate .pdb symbol files. If you wish to generate symbol files in your RELEASE build or in a custom configuration, make sure that "Generate Debug Info" is turned on in your project's Configuration Properties. Backtrace supports the dSYM format. Search for and select "Debug Information Format", set to "DWARF with dSYM File"
Or remaining questions? Please reach out to our support team via the in-app chat on the bottom right of your screen. To minimize the amount of symbols that users need to upload, Backtrace is configured to pull symbols from the below publicly available symbol servers. Caveat for Linux and macOS: Since the symbolification process relies on the name of the application, these symbols will only match with Electron applications named Electron. Reach out to our support team via the in-app chat on the bottom right of your screen for assistance working around this (symbols will need to be adjusted or manually uploaded for renamed ones). For our enterprise customers, Backtrace can be configured to pull from additional public or private symbol servers. For details, reach out to your Account Manager or to the team via the in-app chat on the bottom right of your screen. Navigate to your project configuration page and click on Symbols to see a record of all things symbol (including upload history, search functionality, symbol access tokens and more). Backtrace recommends uploading archives (a .tar.gz or .zip file containing one or more .sym ,.pdb , ELF or dSYM files) of symbols for every build you except to see crashes for. These symbol files can be uploaded manually or hooked up into your build system so they are automatically uploaded. Symbols can be uploaded via the web browser, morgue, curl and HTTP. NOTE: The table above does not include .elf and dSYM files, which are uploadable as an archive via Web Browser, curl, and HTTP. You may also specify a tag query string parameter to any of your symbol uploads in order to group symbols for ease of management. A tag is simply a group of symbols, like a folder on your filesystem. You may want to have different tags for different versions of your application or different platforms. If no tag is specified, symbols are placed into the anon tag. Regardless of your upload method, Backtrace provides a great of observability into symbol state. Backtrace supports .pdb + .sym (Breakpad symbol files), ELF + dSYM files and symbol archives (compressed or uncompressed archives containing the files). There are no restrictions on the layout of the files but you must ensure no relative paths are used and that files have the correct basename. For example, debug information for Editor.exe must be in a file called Editor.pdb or Editor.sym. NOTE: Make sure that your symbols files (.pdb .sym, etc) are uploaded before their corresponding .exe and .dll files, or included in the same archive, to ensure proper processing. Note that .exe and .dll files are only required for 64-bit executables. Backtrace is completely compatible with existing Breakpad and Socorro users. 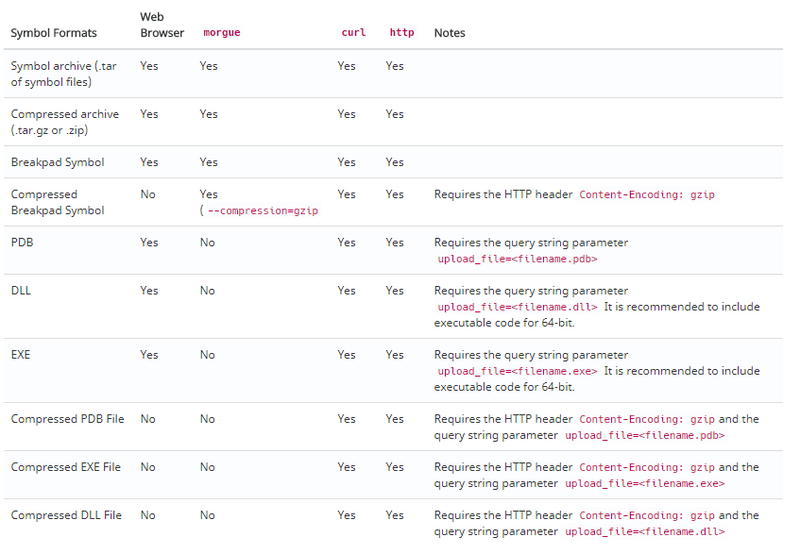 Simply upload the .sym files through an HTTP POST or the sym_upload tool. Ensure that you have an Access Token in order to upload to your instance. You must provide a token (referring to your symbol access token) and a format query string parameter with the value symbols. Access tokens used for symbol uploads are different than error submission tokens. When uploading symbols, make sure you're using a symbol access token, which can be found under Project Settings | Symbols | Access Tokens. Below is an example invocation of a symbol upload using the sym_upload tool. In order to build automation around symbol upload, such as integration into a build and release process, you'll want to interface directly with the HTTP API provided by Backtrace. Simply issue an HTTP POST to <your instance>/post?format=symbols&token=<access token>. An access token can be created by navigating to Projects > Your Project > Symbols > Manage Access Tokens and clicking on the Create a new access token button. Below is an example of a curl invocation to submit a symbol archive. curl --data-binary @symbols.tar -H "Expect:" "https://yourcompany.sp.backtrace.io:6098/post?format=symbols&token=5ae2136d4ef181b0d2afa5ef1d81ff377eea8228d1d883d4552621ed1eff8b87"
Note: For large uploads, include the flag -H "Expect:" to the curl invocation. Navigate to your project configuration page and click on Symbols in order to manage symbols through your web browser. You are able to manually upload .pdb or .sym and compressed archives of .sym, .pdb , ELF or dSYM files directly in your web browser. We recommend uploading a .zip file of all symbols files, rather than individual files. Follow the on-screen instructions for more details. If you are blocked on uploading symbols from the command line, try uploading directly from your web browser. Instructions are available above. If you receive an "invalid token" error in the response when uploading symbols via HTTP, check to make sure that you're using a symbol token and not a project token. You can create a symbol token on the Project Settings page by clicking the Symbols section, then the Manage Access Tokens tab in the middle of the page. Sometimes, symbols can get missed during the symbol upload process. A list of missing symbols for a dump is available in the web debugger annotations pane. For more information about how to acquire this list, refer to the Web Debugger guide. After uploading missing symbols, you can Reprocess Objects to have the dumps with missing symbols reprocessed. Note that the grouping of dumps may change after missing symbols are uploaded. There are a couple of ways to reprocess objects. System Administrators are able to reprocess all objects within a project right from the web browser by opening the menu from the top right of the screen, selecting project settings and navigating to the Reprocess Objects section. System Administrators and Backtrace Support are able to reprocess more specific groups of crashes via the morgue tool. If you’d like more information or assistance reprocessing objects, reach out to Backtrace Support via the in the in-app chat on the bottom right of your screen. If you have the morgue tool installed, you can also check the status of symbol uploads and obtain lists of missing symbols by using the morgue symbol commands. See https://github.com/backtrace-labs/backtrace-morgue for more information. Since .exe and .pdb files are normally stored in the same location, you can use the Windows build tool dumpbin.exe to dump the executable's headers, which includes the matching symbols' name and debug identifier. For example, the following command suggests symbol bcrypt.pdb with id 5C82DF990DA04C46A2B22ABB82D6B66A1. On Windows 32-bit executable objects all of the relevant debug information is stored in the corresponding PDB file and Backtrace will ignore the executable and library files for 32-bit applications. 64-bit executable objects the executable, libraries, and PDB files must be uploaded as some unwinding information required for symbolification is contained exclusively in the executable objects. .dsym files - MacOS .dsym files are supported. .elf files - ELF files are supported. Once you locate and upload missing symbols, make sure to Reprocess Objects, as described in the previous section on missing symbols. In addition to not having uploaded the proper symbol file, another cause for mixups is having a mismatched module name. When viewing missing symbol information, Backtrace will show the name of the module name (executable or dll/library file) that it's expecting that symbol file to match. This is "path" in the missing symbols section of annotations in the Debugger, or shown as "Library" when looking at the tooltip of a frame that's shown as missing symbols. If the name of the module doesn't match, Backtrace will show the symbol is missing, so make sure your symbol files reflect the correct module name, and if uploading exe/dll files, make sure these have the correct names. On Windows, 64-bit applications store some unwinding information exclusively in the executable object (.exe or .dll file). For this reason, we advise to include the executable code of your application and library during symbol upload. These files can be uploaded as stand-alone files, but you must ensure that the file base name matches the base name of the .pdb file. For example, the debug information for Editor.exe is expected to be in Editor.pdb. It is important that the name of the executable is Editor.exe in this context to pair with Editor.pdb. If the executable was uploaded as Word.exe, then you are unable to pair with Editor.pdb. It is recommended that a symbol archive is used. If you are using Visual Studio, you'll need to ensure that symbols are being generated correctly. Additional details are available in the Crashpad Visual Studio document.